Irish Hill Here's a Farewell Favorite that's really gone for good. This sad, dried-up bump is all that's left of Irish Hill. Once an equal in the pantheon of San Francisco hills, Irish Hill was the late 1800s home to thousands of Irish immigrant foundry and mill workers. 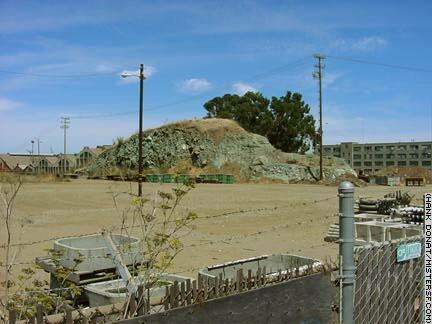 The formerly bustling hill located between Central Basin and the Bay View was well attended by residents of boarding houses such as Jim Gateley's San Quentin House, Cash's, and The Green House. A bare knuckle boxing champ was crowned every Saturday night outside Mike Boyes' Saloon, which sat atop Irish Hill. Then 250 feet high and accessible by a flight of wooden stairs at the corner of 20th and Illinois Streets, Irish Hill's fate was sealed when it was excavated for a World War I expansion of Bethlehem Steel. This would not be the last time the hill was shorn and by the end of World War II a mound less than 50 feet remained of the robust neighborhood, a casualty of the 20th Century. Irish Hill is visible from Illinois Street, but is no destination for visitors. Media tours are one thing, but on the day of Mister SF's visit, some blue collar types at the Self Storage and PG&E facilities that flank the remains of Irish Hill were none too friendly to tourists and curious locals.